Vincom Landmark 81, a luxury tower designed by Atkins, is being constructed in Ho Chi Minh City, Vietnam. Image courtesy of Atkins. The 460m-high skyscraper will be owned by Vingroup and will replace the Keangnam Hanoi Landmark Tower as Vietnam’s tallest building. Image courtesy of Atkins. The tower will feature a five-star hotel, residential apartments and retail space. Image courtesy of Atkins. The modern design of the skyscraper is infused with the Vietnamese culture and draws inspiration from bamboo cluster. Image courtesy of Atkins. Vincom Landmark 81 is a luxury, mixed-use tower being constructed in Ho Chi Minh City, Vietnam. The 460m-high skyscraper designed by Atkins will be owned by Vingroup and will replace the Keangnam Hanoi Landmark Tower as Vietnam’s tallest skyscrapper. The grand tower will be unique in its luxurious facilities in Vietnam and be a symbol for growth and prosperity in the country. It will feature a hotel, residential apartments and retail space. Scheduled to be completed in 2017, the 81-storey tower will be located in one of Vietnam’s prime location, the Vinhomes Central Park, which is a modern township developed by Vingroup in the Saigon New Port area of Binh Thanh District, Ho Chi Minh City. Atkins has provided both the architecture and landscape design for the Landmark 81, whereas Arup has provided the structural design. The modern design of the skyscraper is infused with the Vietnamese culture and draws inspiration from bamboo, a traditional symbol of solidarity, affluence and prosperity. "Scheduled to be completed in 2017, the 81-storey tower will be located in one of Vietnam’s prime location." The tower tapers significantly at the top and offers panoramic views to an array of restaurants, lounges and bars occupying the top floors. The spire at the top of the tower will be internally illuminated creating a dramatic visual. Spread over 241,000m², the tower’s landscape will add to the impact of the structure and will be a statement to Vietnam’s booming success. The building will feature 81 floors and three basements and will be a cluster of 25 thin units of varying heights. Roof gardens will adorn the top of the shorter units that will be located on the outside, where as taller sections will be at the centre. Owing to its location near the Saigon River, the building will not only offer resplendent views but also provide connectivity through major road and water transportation services. A five-star hotel called Vinpearl Hotel will be built within the tower. The hotel will have 450 rooms and suites, including a 1,000m² Presidential Suite that offers a 360° view of the city. The bedrooms will be situated above the main lobby and functions area that occupy the 47th and 48th floors. Offering a panoramic view, a world-class restaurant and bar will be located on the 66th and 67th floors of the tower, making them South East Asia’s highest restaurant and bar. An observatory on the 79th floor, the highest observatory in South East Asia, will provide visitors impressive sights of the city. Exhibition space will be present up to level 81. Abeno Harukas is a multifunctional urban space situated in the Abeno district of Osaka, Japan. A total of 900 elite apartments and office spaces of 400m² each will be developed within the tower. At the base of the building will be a 59,000m² Vincom Center mall, which will feature some of the best retailers, adding to the ultimate shopping experience of the visitors. An exclusive club will be made available to the residents and VIP guests with facilities such as a sky lounge, cigar lounge and a wine lounge. A large public square equipped with a modern fountain will be built. Other facilities in the tower will include a 3,000m² gym, a spa and a 1,000m² pool system comprising an infinity pool and a modern jacuzzi. A 2,000m² ice rink, the biggest in Ho Chi Minh City, will also be built. Entertainment features will include a three-storey Cineplex and an IMAX screen. The tower’s façade will be unitised, pre-fabricated and factory-assembled. For easy installation, all the façade units will consist of 1.5m-wide modules. The façade’s transparency will increase moving upwards from the stone base to the body exhibiting glass with fins and finally a complete glass façade at the top. The spire will possess a highly perforated glazing to avoid increase in the wind load at the top. The glass used will be energy-efficient low-E type that will be UVA-protective, regulate temperature, transmit light and reduce power consumption. 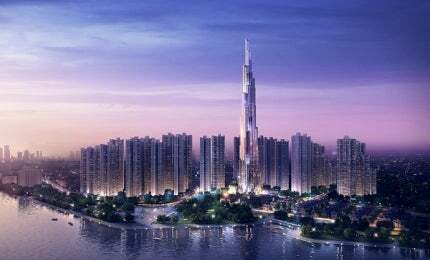 Drinking water provided to the apartments in Vincom Landmark 81 will be compliant with the European standards for the first time in Vietnam.